Sunlight is by far the largest carbon-free energy source on the planet. Harnessing solar radiation will not only provide cost-effective, self-sufficient energy but it will also significantly reduce CO2 emissions which are destroying the planet. The ability of the home and work space to reduce harmful emissions whilst keeping up-to-date with the demands of technology is crucial in the modern world. More energy from the sun strikes the Earth per hour than all other energy consumed on the planet each year. Converting free heat from the sun into energy, is a global priority. The UK receives approx 900-1200 kW/hrs solar energy per square meter of land area each year. Using current thermal collector systems, there is enough solar radiation in the UK to provide 50%- 60% domestic hot water requirements for a whole year. During summer months it is possible to obtain 100% of the demand for hot water through solar panels. Even on cloudy days, enough direct and diffuse solar radiation can provide heating. As the winter months arrive and temperatures plummet to below zero, solar energy continues to relieve the load of existing boilers or heat pumps, reducing the overall cost of energy bills through stored water. 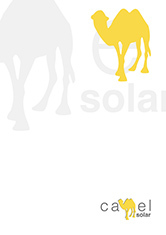 Camel Solar’s more advanced technology systems have been created to optimise solar energy insolation, absorption and transmission. Globally, solar energy systems can harness enough energy to drastically prevent climate change. The social responsibility to integrate solar panels can be seen by government incentives and feed-in tariffs, to encourage consumers to consider this efficient form of energy generation. Approximately 28% of the UK’s CO2 emissions come from domestic homes and around 49% of the energy demand of the EU comes from the heating and cooling sector. Solar energy is effective not only for the home, but also for the planet.